Check out this for a front cover, well saying that, check out all of the Albion front covers. They’ve always managed to create progressive, interesting and a different cover every issue. Not going for the safe and regular “rider doing trick” format, they’ve always taken the other route that a lot of mags were scarred to take. I remember years ago when I did some work for a BMX magazine and they wanted to run one of my pictures as the cover. It was a photo of someone doing a tweaked table off of a hipped bank to wall that the rider had built themselves. They’d spent ages making this thing and there was a story to go with the cover, hence the magazine wanting to run it. However the photo was taken in the landscape format and they wanted a portrait shot of the same trick if possible. Well I told them that I didn’t have one and that they should go for something a bit different and run a landscape photo to fit inside a portrait layout, showing the film perforations and maybes have space at the top to expand their logo and at the bottom to fill in whats happening in the magazine… Well they saw this as a bit too edgy and were hell bent on thinking that this kind of cover wouldn’t be a safe choice.. Needless to say a few months down the line, not making the right choices led to the magazines demise. I can’t help but think that if you aren’t prepared to take some risks sometimes and try new things that you are pretty much going to be left in the dirt while everyone else around you carries on progressing. And this leads me to my point about this post, a friend of mine, Adi Gilbert of 99 Seconds, had the opportunity to design the latest cover of the Albion Magazine for Issue 11. It’s so amazing when you see some of your friends artwork in a magazine or advert but when they get the front cover of something which is sent all over the world, you can’t help but be a bit stoked for them. Hat’s off to Adi and the Albion for doing it differently and I can’t wait to get a couple of copies myself. 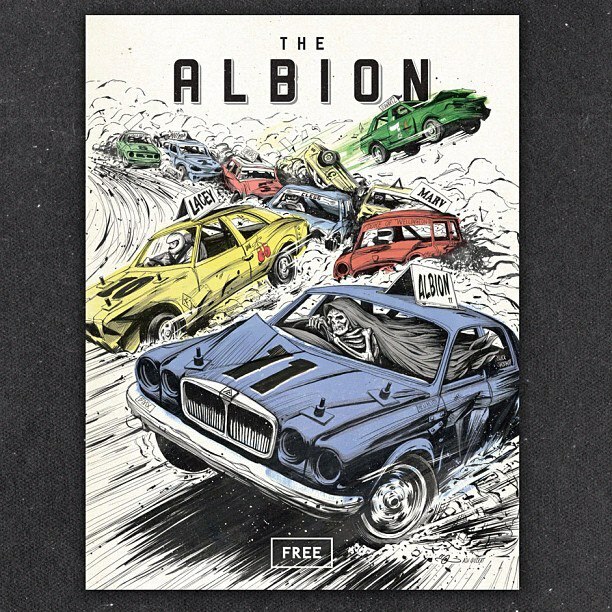 I stuffed an issue of the Albion 11 through your letterbox this afternoon. I knocked too but you weren’t in. hope the bollywood feature is going well.